My favorite cake is cheese cake, maybe chocolate cake as well. so I Got this recipe from allrecipes.com to cook for Emily and Katie. Hoping it will turn out well. Grease the sides of your pan, it will not crack, since cracking often happens in the cooling process as the cake pulls away from the sides. Since I began greasing the sides,I have not had a cracked cheesecake. 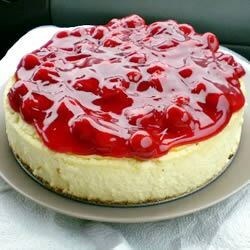 A couple of things you should know about cheesecakes: OVERBEATING WILL CAUSE A CHEESECAKE TO CRACK. Beat cream cheese with sugar only until smooth. Proceed with a wooden spoon for the rest of the recipe. OVERBEATING WILL CAUSE A CHEESECAKE TO HAVE THE “WRONG” TEXTURE. Air bubbles, gritty/not creamy texture, etc., are fixed my the same instructions above. OVERCOOKING WILL CAUSE A CHEESECAKE TO CRACK. Do NOT cook this cheesecake until it’s set. Matter of fact, don’t check it at all. Put the cheesecake in the oven, set the timer to 60 min., turn the oven off, and forget it. I mean it! Don’t open the oven, just leave it alone to do its thing. Make sure that your ingredients are around room temperature, not cold, otherwise your batter will be lumpy. Wrap your springform pan with 2 layers of aluminum foil to prevent water in the bain marie (water bath) from seeping in. Place your springform pan in a water bath in the oven, filled with 1 inch of very hot water, then proceed to bake as instructed in the recipe. This entry was posted in Cooking and tagged cheesecake, dessert, Food by shaoxilizheng. Bookmark the permalink.